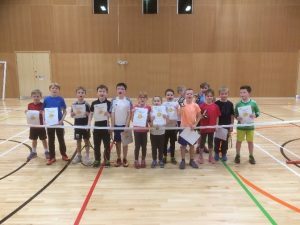 Youngsters in and around Workington have been taking to the court over the last three years thanks to more than £7,000 from the Workington (Ashfield) Lawn Tennis Club Fund. The grant, awarded to Tenniswise, gives children the chance to access regular tennis coaching that is low cost and on their doorstep, ensuring people in West Cumbria have access to the sport. Whether just wanting to play for fun, have a regular go at tennis or wanting to improve, compete and develop their game, the benefits of regular, structured coaching is a very important factor in the health and wellbeing of youngsters in the area. As well as the obvious health benefits, coaching can help the development of personal and social skills, giving the players more confidence and helping them deal with everyday challenges. Tenniswise, set up by coach David Wise over ten years ago, provides tennis coaching, refereeing and competitive opportunities. Other activities also attract young leaders and volunteers, who help with coaching and umpiring. David Wise said: “Two children stand out because they have gained a lot of confidence through attending the coaching. The first one has suffered from anxiety issues among groups of people but has improved so much socially from mixing with children away from his school. The grant has not only given youngsters the chance to have regular indoor coaching but also the chance to compete locally against each other, as well as with children from other parts of the county and further afield. Workington Ashfield Tennis Club disbanded in 2011 and money from the sale of the club set up the fund to ensure people in the area could still access tennis sessions.